While preferring silence to music from the West, chimpanzees apparently like to listen to the different rhythms of music from Africa and India, according to new research published by the American Psychological Association. "Our objective was not to find a preference for different cultures' music. We used cultural music from Africa, India and Japan to pinpoint specific acoustic properties," said study coauthor Frans de Waal, PhD, of Emory University. "Past research has focused only on Western music and has not addressed the very different acoustic features of non-Western music. While nonhuman primates have previously indicated a preference among music choices, they have consistently chosen silence over the types of music previously tested." Previous research has found that some nonhuman primates prefer slower tempos, but the current findings may be the first to show that they display a preference for particular rhythmic patterns, according to the study. "Although Western music, such as pop, blues and classical, sound different to the casual listener, they all follow the same musical and acoustic patterns. Therefore, by testing only different Western music, previous research has essentially replicated itself," the authors wrote. The study was published in APA's Journal of Experimental Psychology: Animal Learning and Cognition. "Chimpanzees may perceive the strong, predictable rhythmic patterns as threatening, as chimpanzee dominance displays commonly incorporate repeated rhythmic sounds such as stomping, clapping and banging objects," said de Waal. 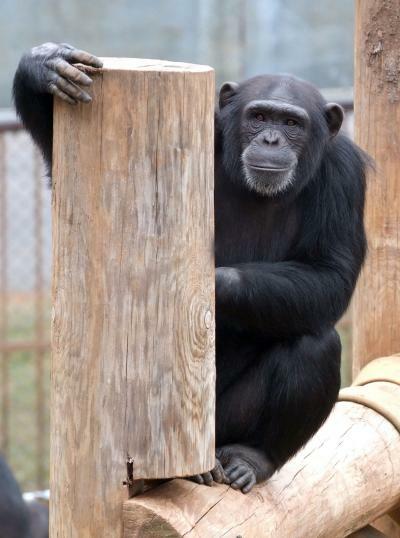 Sixteen adult chimps in two groups participated in the experiment at the Yerkes National Primate Research Center at Emory University. Over 12 consecutive days for 40 minutes each morning, the groups were given the opportunity to listen to African, Indian or Japanese music playing on a portable stereo near their outdoor enclosure. Another portable stereo not playing any music was located at a different spot near the enclosure to rule out behavior that might be associated with an object rather than the music. The different types of music were at the same volume but played in random order. Each day, researchers observed the chimps and recorded their location every two minutes with handwritten notes. They also videotaped the activity in the enclosure. The chimps' behavior when the music was played was compared to their behavior with no music. "Chimpanzees displaying a preference for music over silence is compelling evidence that our shared evolutionary histories may include favoring sounds outside of both humans' and chimpanzees' immediate survival cues," said lead author Morgan Mingle, BA, of Emory and Southwestern University in Austin. "Our study highlights the importance of sampling across the gamut of human music to potentially identify features that could have a shared evolutionary root."